We know what the ladies like. It’s been 11 whole years since Gears of War hit store shelves for the first time on November 6th 2006. Many of us here still have vivid memories of booting up Gears of War for the first time on Xbox 360 – instantly gripped by the world, characters and gameplay that felt like no other game before it. Our big Gears anniversary also seems especially poignant this year. The original Gears of War pushed graphical fidelity on console to new heights and, today, gamers around the world can experience a new leap in console graphics for Gears on Xbox One X. The team are really proud of what we’ve been able to achieve with Gears of War 4 enhanced by the power of the Xbox One X, and we hope it leaves you with that same awe-struck feeling you had when you first saw Gears of War running on your Xbox 360. To celebrate this massive milestone, we’re dedicating November to one huge celebration event! There’s tons going on – from the return of Classic Delta Squad (!! ), to Double XP, weekly special events, new Flaming Weapon Skins to earn and small surprises sprinkled throughout. Kick things off by watching the trailer above and then scroll on down for details on everything you can get stuck into this month beginning at 10am PDT on November 6th! 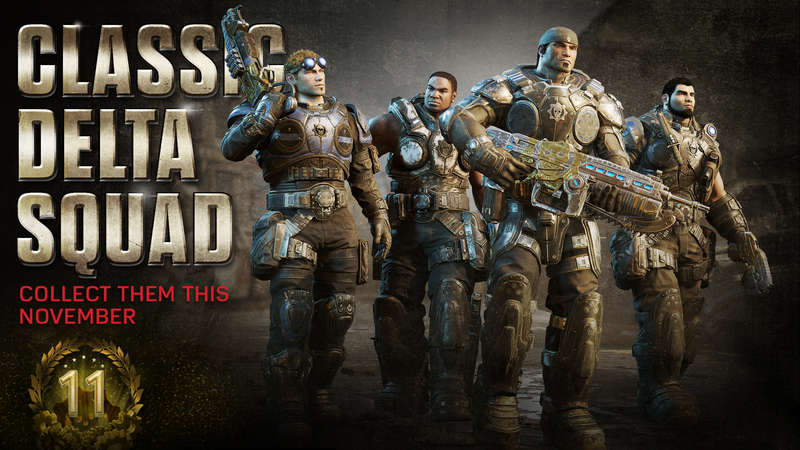 Available throughout November, this 5 Card Pack contains a chance at any of the 4 Delta characters – Marcus, Dom, Cole and Baird – plus the commemorative 11 Years of Gears weapon skin set! This is the fastest way to complete your 11th Anniversary Collection. The Classic Delta Gear Pack is available until December 3rd for 2000 Credits, including the option of the Mega Pack variant for real world money which guarantees a Delta Squad character. For those with less Credits to spend, one member of Delta Squad will be available each week in a special limited-time 400 Credit Gear Pack! This smaller Gear Pack contains 3 Cards – a Horde Bounty or 11YOG Emblem, plus two items from the 11 Years of Gears collection (which includes a chance that week’s Featured Delta Squad member). These Packs have a great chance of dropping the character, but you’ll need to grab them while availability lasts. If you miss out, you’ll still have a chance to add them to your collection via the Classic Delta Squad Pack. Every playlist in Gears of War 4 gets the Double XP treatment for this week long celebration of the 11th Anniversary! The Gears 1 Classic is all about old school Execution with fast self revives with Gears 1 maps and weapons only, along with the return of the Marcus and RAAM team big heads from last year! Look out for a new Flaming Weapon challenge sign up on Tuesday where you’ll be challenged to complete objectives in this playlist to earn the coveted Flaming Gnasher. Dom is the featured character for our Weekly Delta Pack during this period. Party like it’s 2008. Gears 2 Classic brings together Guardian and KOTH in this 2XP playlist only featuring maps and weapons that appeared in Gears of War 2. There’ll also be a new Flaming Weapon skin up for grabs if you can complete the new challenges for this playlist. Cole is the featured character for our Weekly Delta Pack during this period. Thanksgibbing returns to Gears of War 4! This KOTH variant arms you with a Cluckshot (a holiday themed Boomshot) for a ton of explosive fun – and you can earn the animated Cluckshot weapon skin through another set of challenges to complete. Marcus is the featured character for our Weekly Delta Pack during this period. Torque Bow Tag is back for the first time since February! Duke it out to earn your Flaming Torque Skin by completing challenges and earn Double XP exclusively in this playlist. Baird is the featured character for our Weekly Delta Pack during this period. This is just the start of what to expect this month. We’ll be launching surprises throughout the month – both big and small – as well as running some new community activities. Our first surprise is coming this Thursday!